The Inbreds. I’m a big fan of The Inbreds, they didn’t always stick to their schtick of bass and drum, but even when they did, they succeeded in making interesting melodic pop that almost defies their instrumental limitations. That skill at crafting amazing melodies is what makes The Inbreds so spectacular. Mike O’Neill and Dave Ulrich deserve every accolade they’ve received and more. If you don’t know their music, check out their records, they’re all inexpensive at zunior.com. While you’re at it, you might also want to check out Mike O’Neill’s three solo records. All those records will be reviewed in good time. 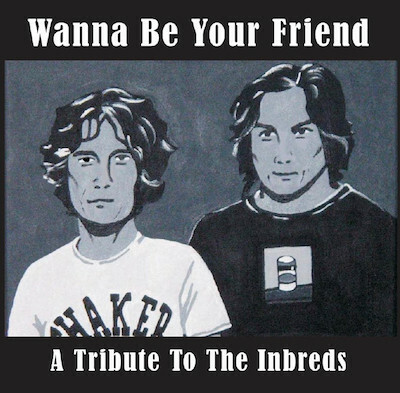 Until then we have… Wanna Be Your Friend: A Tribute To The Inbreds. Yes, an Inbreds tribute album. The artist selection is pretty impressive, a lot of bands I had never heard of, but there’s also The Just Barelys, The Superfantastics, Ruth Minnikin, members of Plumtree, Sloan, Super Friendz, and Eric’s Trip. It’s quite the lineup. It’s not only the artist selection, but the song selection. It seems almost as if I had chosen the tracklist myself. I asked Dave Ulrich, drummer from The Inbreds, and owner of Zunior.com on his thoughts on the album. AA: What was your reaction when you first heard about the record? Did you have any input? DU: I was pretty surprised because, although Gooseberry has gone on to do a whole series of tribute albums of that mid-90’s indie Canadian era, the Inbreds one was the first installment. I didn’t have any input, but I believe Scott did tell me about it before it was finished. AA: Is it cheating because Mike appears on the record (performing as part of Ruth Minnikin & Her Bandwagon)? DU: At least we didn’t create a mock back to cover one of our songs. I know Def Leppard used to have an opening act for their own shows that did cover songs, but the act was actually the band in disguise. That kinda thing. AA: Did any songs really stand out to you? DU: Ruby Jean and the Thoughful Bees doing Amelia Earhart. I think that one really got the spirit of where that song was coming from. AA: Any song you wish was included, but wasn’t? DU: I would have loved to hear a metal band doing Russ. It’s not too late everyone!!! AA: There’s a band on the record calling themselves Alicia Penney & The Excellent Navigators, obviously a references to “Amelia Earhart.” Once upon a time was a band called Laura Peek And The Winning Hearts, a reference to The Inbreds album Winning Hearts. How do you feel these tributes play into the legacy of your work? DU: Mike has spoken before about the way we, and all indie bands that we respected, were ‘humble’ in the 90’s. You really had to be there to appreciate it. I’m not sure there is an equivalent vibe today, although their are still many artists that sincerely come from a humble place, obviously. It’s just that there was a unique version of it, I think, we were out there doing our thing. Anyways, I think that a big part of what Inbreds should/could be known for is how hard we worked recording/touring/releasing, consistently over time. Combine that with an equal heavy effort from Mike on the songwriting side, and I that is why it worked as much as it did. The effort was sincere. AA: Are the covers that stay true to the original more entertaining to you, or the ones that take the songs in a new direction? DU: I always like covers that go in a new direction. Giant thanks to Dave Ulrich! I’m filing this album as male, Canadian, and Ontarians, as that describes the band being paid tribute.